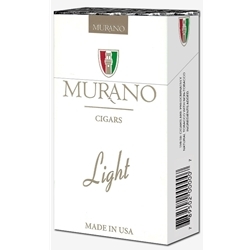 Murano Light Filtered Cigars is one of the leading tobacco products on the market. Because the brand is very similar to generic and premium cigarettes with its mild to medium taste and flavor, many smokers find the Murano Light Filtered Cigars to be very pleasant and fulfilling. Each carton is available in Soft 100's and Box 100's and packaged 20 cigars per pack, 10 packs to a carton for a total of 200 premium filtered cigars. Just like cigarettes!